Editor’s note: The following is an excerpt of the new Hoover Press book, Energy Efficiency: Building a Clean, Secure Economy. President Obama, in his 2013 State of the Union address, reviewed US energy progress since he took office and described an “all-of-the-above” approach for further progress. The accompanying White House Fact Sheet focused on domestic energy production and its impacts on the economy, energy security, and the environment: "Since President Obama took office, oil and gas production has increased each year, while oil imports have fallen to a 20-year low; renewable electricity generation from wind, solar, and geothermal sources has doubled; and our emissions of the dangerous carbon pollution that threatens our planet have fallen to their lowest level in nearly two decades. In short, the President’s approach is working. It’s a winning strategy for the economy, energy security, and the environment." Although the president’s summary statements focused on the domestic supply of energy, the administration did give some recognition to energy efficiency in cars and trucks. Nevertheless, Obama appeared to ignore other energy-efficiency improvements that had been continuing for decades: "The Environmental Protection Agency (EPA) has released a new report that underscores the progress we have made to improve fuel economy, save American families money at the pump, and reduce carbon pollution that contributes to climate change." The White House Fact Sheet, like the vast majority of energy statements from members of both political parties, paid scant attention to the many energy-efficiency enhancements since the energy crisis of 1973–74. The supply side of energy markets again was the focus of political discourse, even though most of the action has been on the demand side of these markets. In fact, these historical changes in energy efficiency have had more beneficial impacts on US energy security and on the environment than all of the increases in domestic production of oil, gas, coal, geothermal energy, nuclear power, solar power, wind power, and biofuels combined. This book reviews the advances in energy efficiency within the United States since the 1973–74 energy crisis and documents the generally unheralded contributions of energy efficiency to the economy, energy security, and the environment. This history suggests that the United States can enjoy the many benefits of future efficiency gains if it maintains the interacting conditions that enabled accomplishments of the past 40 years. With careful nurturing of private- and public-sector energy efficiency, with appropriate pricing and other policies, the trend of increasing energy efficiency can be accelerated, with further beneficial impacts on the environment, national security, and the economy. To understand why energy efficiency—economically efficient reductions in energy use—is a desirable policy strategy, one needs merely to reflect on the basic goals underlying United States energy policy, at least since the energy crisis of 1973–74. These goals have been adopted not just by the US, but internationally, although different countries place different emphases on the three goals. Energy policy typically strives for improvements in the health and growth of the economy, protection of the domestic and international environment, and enhancement of domestic and international security. These three policy goals are summarized by the energy policy triangle. 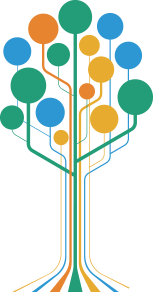 Energy-related issues of the environment include local and international impacts of energy production and use. Energy efficiency is good for the environment: reductions in energy use mean that less energy needs to be produced, transported, or transmitted. Because virtually all energy production and transportation have negative environmental consequences, energy efficiency reduces environmental impacts. Stated most succinctly: the cleanest energy is the energy you don’t need in the first place. One particularly important environmental issue is the role of energy efficiency in reducing greenhouse gas emissions in the atmosphere, either carbon dioxide or methane. Combustion of fossil fuels is the dominant source of greenhouse gas emissions in the United States. In a later chapter of this book, I quantify the role of changing intensity of energy use and that of energy system decarbonization. Other domestic environmental impacts include release of particulates, oxides of nitrogen, sulfur dioxide, and other pollutants into the air; water pollution associated with the production of fossil fuels such as coal or natural gas; use of water for production of primary energy or for conversion of primary energy into electricity; and disruption of natural habitats. Issues of security include vulnerability of the United States to deliberate or accidental restrictions on oil imports, vulnerability of the US economy to rapid fluctuations in energy prices, or limitations placed on US foreign-policy options as a result of US dependence on foreign energy sources. Domestic security issues include protection against terrorist attacks on energy infrastructure such as the electric grid, or impacts of natural disruptions such as hurricanes or other storms. Energy efficiency is beneficial for security. For at least 60 years, the United States has been a net importer of energy, particularly oil. Subsequent to the energy crisis, energy efficiency has allowed the United States to reduce energy imports so that the United States may soon become self-sufficient in energy, with energy efficiency having a larger role than domestic energy supply increases. Reductions in electricity use can reduce stress on transmission lines and congestion in the grid and can increase flexibility of the existing grid by reducing the time variability of electricity use, and therefore can increase domestic security. In this book, data from the US Energy Information Administration is used to decompose changes in the net energy imports, separating changes associated with increases in energy efficiency from those associated with increases in the domestic production of energy. Economic issues include growth of gross domestic product (GDP), the number and quality of jobs available for the population, and the distribution of wealth. Economically efficient reductions in energy use are, by definition, good for the aggregate economy: economic benefits exceed the economic costs. Reductions in the government use of energy can provide savings for the federal government, reduce the federal deficit, and reduce the balance of trade deficit. Cost-effective reductions in the use of energy by businesses can make them more profitable and thus increase GDP. And cost-effective reductions in the use of energy by households can leave more disposable income available for other purposes. Particularly for low-income people, reductions in energy costs can be important for overall well-being. Reduced use of electricity has avoided the need to construct thousands of megawatts of new electric generation stations, saving billions of dollars. Four terms are used here to describe changes in the energy used in the economy: energy efficiency, energy conservation, energy intensity, and energy productivity. The first two—energy efficiency and energy conservation—typically describe changes or differences in the way energy is used or the amount of energy used. These are often applied to a device, a process, a business activity, or a personal choice. The second two—energy intensity and energy productivity—provide aggregate measures of the total energy used, relative to the size of the economy. For example, replacing a 60-watt incandescent lightbulb with an 11-watt LED light that gives the same quality of light changes the amount of energy used to provide the same amount of light. The 11 watts versus the 60 watts describes the difference in energy use at a device-specific level. This change to an 11-watt light would typically be referred to as improving, enhancing, or increasing “energy efficiency.” And that change might also be referred to as “energy conservation.” Assuring that the light is turned off when the room is not occupied would typically be referred to as “energy conservation” but can also be referred to as improving, enhancing, or increasing “energy efficiency.” These are both measures describing change in the way energy is used or differences between alternative ways energy can be used. All energy-use decisions, taken together in an economy, result in the total energy used. Energy intensity of the economy is a summary statistic measuring the total energy used in the economy, and is not a measure of changes in energy use. Energy intensity of the economy is the ratio of (1) the total amount of energy used in all sectors of the economy to (2) the (inflation-adjusted) GDP. Equivalently, the “energy productivity” of the economy is the ratio of (2) the GDP to (1) the total amount of energy used in all sectors of the economy. Energy efficiency and energy productivity are simply mathematical inverses of each other. For example, in 2014 the energy intensity of the US economy was 6120 BTUs per dollar of GDP (2009 dollars). The energy productivity was $163.40 of GDP per million BTUs of energy used. One percent less energy used for a fixed GDP would reduce the energy intensity by 1 percent and equivalently would increase the energy productivity by 1 percent. In this book, I primarily use the term energy intensity and only secondarily use energy productivity. Energy intensity has been the more common measurement and accurately describes the concept. The combined impacts of all energy-efficiency or energy-conservation changes are reflected in the aggregate statistic, energy intensity. Energy intensity gives an indication of the economy-wide total of energy-efficiency enhancements but does not directly measure energy efficiency. Energy intensity is calculated and reported by statistical agencies of the US government, in particular, the US Department of Energy, Energy Information Administration. Although some conventions are needed to calculate both total energy use and GDP, these conventions remain the same over extended periods of time, so that energy intensity (or energy productivity) is measured and reported consistently over time. Given the conventions, there would be no disagreements about the measure of energy intensity. Although energy intensity is an agreed-upon and objectively measured concept, the term energy efficiency is used differently by the various scientific disciplines and thus can have different meanings among people. One precise definition comes from physics. Efficiency is a ratio: energy transferred to a useful form compared to the total energy initially supplied. But that definition, though precise, is too narrow a concept for energy policy discussions. Although the latter concept is a good starting point for analysis of the energy system, one must be clear what is meant by “more services” or “the same services.” If an automobile drives 100 miles using 5 gallons of gasoline, and another identically drives the same 100 miles using 8 gallons, one can easily say that the first is more energy efficient. But if one person uses a video connection to a distant meeting using very little energy and another flies to the same meeting using much more energy, the first may well be more energy efficient, even though the final services may be somewhat different—being at the meeting is somewhat different from participating in the meeting only by video. More broadly extending the concept, if the US economy structurally shifts to using less energy but does not decrease GDP in doing so, it can be said to have become more energy efficient. For the definition of energy efficiency, the services would be “economic output,” that is, “services” would be closely approximated by GDP. In this book, such changes are counted as energy-efficiency enhancements because they reduce the use of energy but do not reduce the overall value of goods and services available to the US economy. In energy efficiency, this book includes changes resulting from telecommuting to meetings, profitably producing less energy-intense outputs, shifts in modes of transport, product changes resulting from R&D targeted toward less energy use, changing cultural norms toward using less energy, and structural shifts in the economy, as long as these do not decrease the sum total value to all members of the economy. Another concept is that of energy conservation, which also can have several different meanings. Widely used is the idea: “Energy conservation refers to reducing energy consumption through using less of an energy service.” This concept fits with the concept that something is energy efficient if it also delivers more services for the same energy input, or the same services for less energy input. The concept would be simple if discussions were limited to a discrete action, such as turning off a light. But as in the discussion of the energy-efficiency concept, the definition of energy service is essential to discussion of the energy conservation concept. If energy service were defined consistently, energy-use reductions would be either energy conservation or energy efficiency, but not both, depending on whether there was a reduction of the service. The difficulty is that often the concept of service is implicitly used differently when discussing energy efficiency or energy conservation. Another definition of energy conservation is “reduction in the amount of energy consumed in a process or system, or by an organization or society, through economy, elimination of waste, and rational use.” That second definition is essentially the same as the energy-efficiency definition. Under this definition, the concepts of energy efficiency and energy conservation are virtually identical. Under this definition energy efficiency and energy conservation would be synonymous. Rather than confront the various, often contradictory, connotations of the term energy conservation, this book avoids using this term except when necessary, such as quoting other documents. Instead, this book focuses on energy efficiency and uses energy intensity as a way of indicating the amount of energy-efficiency enhancements that have occurred over time in the US economy. Even with its many economic, environmental, and security benefits, numerous barriers inhibit full implementation of energy-efficient actions. Many energy options are not chosen, even though they appear to be desirable to the individual or organization making the decision. These are often discussed informally as “unpicked fruit” or “fruit rotting on the tree.” More formally, the failure to choose optimally is referred to as an “energy efficiency gap.” It is not the purpose of this book to examine these barriers in any depth. 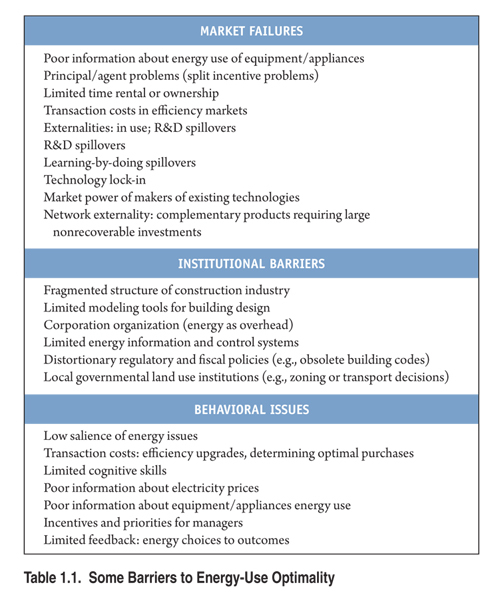 But they can be summarized in terms of market failures, institutional barriers, and behavioral issues, all typically leading to underutilization of energy-efficiency options. Some barriers are listed in Table 1.1. Much literature has been aimed at identifying methods for addressing these various barriers, and interested readers can find much valuable material. Suffice it to say, however, that there is good news and bad news. The bad news is that fixing these issues can be very hard. The good news is that there are further opportunities to enhance energy efficiency based upon overcoming barriers. And as will be seen from the discussions in this book and in the other sources that have identified the issue of energy-efficiency barriers, many policy and organizational changes already being implemented are designed to overcome these market, institutional, and behavioral barriers. There is other good news, based on the history of energy-efficiency progress in the United States. Even though many energy-efficiency options remain, the energy-efficiency enhancements that have already been broadly implemented are ubiquitous throughout the US economy. This history shows that, as stated above, energy-efficiency enhancements since the energy crisis of 1973–74 have had more beneficial impacts on US energy security and on the environment than all of the increases in domestic production of oil, gas, coal, geothermal energy, nuclear power, solar power, wind power, and biofuels combined. The fundamental importance of energy efficiency may come as a surprise because one cannot easily observe what energy use would have been without the greater efficiencies. Most energy-efficiency changes are rather invisible to outsiders (and often to insiders), and thus most improvements are unrecognized. Much of the progress has been the result of cumulative small changes broadly distributed throughout the economy. Such cumulative, small, broadly distributed changes together have greatly reduced the energy intensity of the US economy.